A few days ago I wrote a post entitled Which is the best netbook operating system? The result of my experiments were rather skewed having neither access to a netbook at the time (I used virtualization on my Macbook Pro) nor to the promising Jolicloud operating system. I bought myself an Acer Aspire One netbook, for the bargainous price of £99 + delivery on eBay. There was nothing wrong with it at all. I’ve simply added 1GB RAM (c.£11) to make it a bit more speedy. 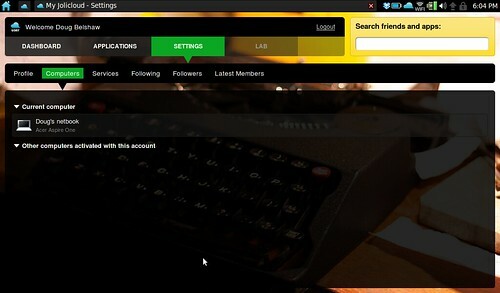 As you can see below, you ‘sign in’ to Jolicloud and can follow other users. This means you can see what apps. and other things they’re using. If you have more than one computer running Jolicloud, you can see the on the screen below. I assume this will lead to the ability to ‘sync’ them in future? 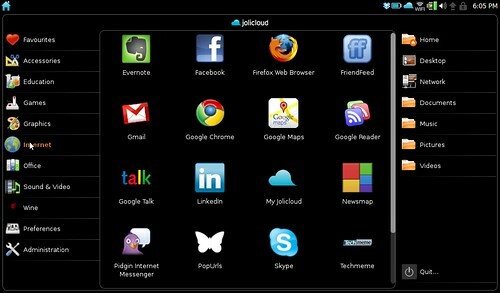 Below you can see some of the applications I installed via Jolicloud and how they showed up under the ‘Internet’ tab. 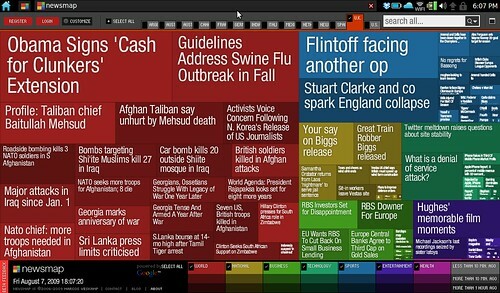 Finally, another ‘application’ – this time newsmap. 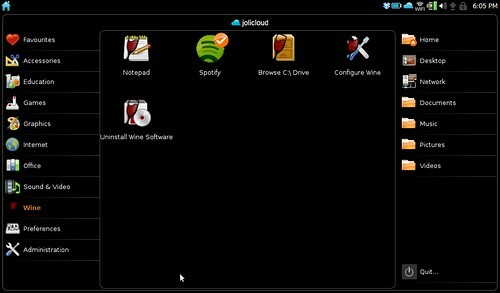 Jolicloud simply opens it full-screen in a window. Finally, just a note to say that everything – and I mean everything, works out-of-the-box. The latest release even has a drop-down menu at the top-right to select what speed you want the processor to run, or if you want it to run ‘on demand’. Legendary. I’ve been invited to be part of a Becta project into Open Source Software (OSS). “What is OSS?” I hear you ask. 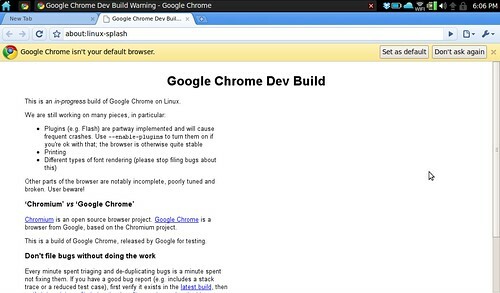 A Google define: open source software search does a reasonable job, but for the layperson something a bit closer to home is needed.In a strange way, using OSS is a bit like buying Fairtrade products. Most people don’t see the direct results of their choice: they’re a water droplet in a beneficial deluge. I’m sure you’re aware that creating software programs and web applications involves ‘programming’; programmers enter code in one of many programming languages. When this ‘source code’ is ready to be released, it is ‘compiled’ ready for Joe Public to be able to install it on their computers. Joe Public, however, can never read what was in the source code. Usually, that’s hidden and protected by copyright. OSS, however, makes the source code readily available. This means that anyone with the requisite knowledge can make changes to the software. Note that even though OSS is usually free, nothing about the philosophy behind it says that the software can’t be sold for profit, just that the source code should be made available (under something called the GPL). Strong communities often develop around popular OSS. You may have heard of an operating system called Linux. There are different ‘distributions’ (or versions) of this – perhaps the most popular being Ubuntu. The PCs in my classroom run Edubuntu, a derivative. You’d be amazed at what a community can put together and make available free of charge! I don’t know if you’ve ever been in a situation where a program or web application you’ve relied upon has stopped being developed, but I certainly have. It’s frustrating and there’s nothing you can do about it. With OSS, however, good projects never die due to the community being able to access the code. Someone else can come along and continue developed the software. Do YOU use Open Source Software? I’m pleased to say that I returned from the Apple Store, Meadowhall with an Intel Core 2 Duo Macbook. Yes, the one with the 2Ghz processor(s) and 80GB hard disk. Which leaves me in somewhat of a quandry: do I sell it (as I swore I would) and make c.£800 whilst keeping the (actually rather good) Acer laptop I bought recently, or do I swallow my pride and keep the admittedly very cool Macbook? 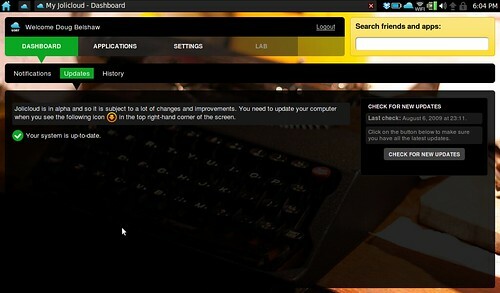 I’ve actually quite enjoyed using Ubuntu Linux recently, so it’s a harder decision than you’d think.